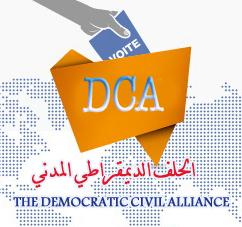 The Democratic Civil Alliance presents a national Syrian solution to the crises in Syria. A solution that is based on the Geneva Communique of 30 June 2012 and is inclusive of all the players of the conflict. Drs. Haytham Manna and Rim Turkmani, representatives of the Allianc, just finished a visit to New York City. They met with UN officials and diplomats including the president and members of the Security Council. On Monday, they met with officials at the State Department and discussed the possibilities of resolving the conflict through negotiations to end the killing and move towards a civil democratic Syria. The National Press Club in Washington will host a press conference for the representatives of the Democratic Civil Alliance on March 19, 2013 10:00 AM. By SIC in English-dca on March 19, 2013 .